My dual-battery isn’t charging. I had a solenoid system installed in my 4×4 just over a year ago. The setup seemed to work fine the first time, but now there’s very little power in my auxiliary battery when I get to camp. On my most recent trip, I spent three to four hours driving between camps, but by the following morning the battery was flat and my fridge wasn’t running. I’ve heard reports that a solenoid-based dual-battery system doesn’t work with some vehicles, and that I should switch to a DC-DC system. But before I fork out thousands of rands on a second system, can you offer some advice? We hear these complaints on a daily basis, and the answer is surprisingly simple: You need a 220V maintenance charger. Some time back, a leading safari rental company ran into a similar problem with their fleet of vehicles. Each vehicle was fitted with a National Luna Intelligent Solenoid dual-battery system, along with a wet-cell 105A deep-cycle battery. This setup worked well initially, but as the months went by the auxiliary batteries weren’t providing enough power – even after a long drive. The problem had nothing to do with the vehicle’s alternator or with the solenoid dual-battery system, and everything to do with the fact that the batteries weren’t lasting. The problem is two-fold: A deep-cycle (wet cell) battery is not necessarily the best choice; and all batteries need maintenance! 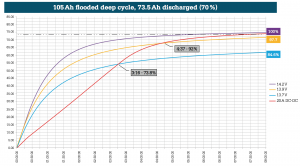 The 105A deep-cycle (wet cell) battery is arguably the biggest selling unit in the dual-battery market, but if you look at the graph featured here, you’ll see that in many cases this battery is not an ideal choice. It takes more than just a few hours to restore full power to a deeply discharged deep-cycle battery. Because a 20A DC-DC charger limits the current output to 20A, in many cases – if your alternator’s output is 13.7 V or more – it slows down the recharge rate and becomes a limitation, not an advantage. HOW DOES THIS RELATE TO BATTERY MAINTENANCE? Most holiday travellers don’t drive for more than a few hours a day, which means most deeply discharged (deep-cycle) batteries are in a permanently discharged state. Or to put it another way: Their auxiliary battery is sustaining long-term damage and losing its ability to hold a charge. This is why the dual-battery system worked the first time, and perhaps even the second, but if you don’t maintain the charge between trips, your battery’s ability to hold a charge will diminish with every passing month. Contrary to popular belief, it takes a surprisingly short period of time for a battery to sustain permanent performance damage if left in a discharged state. Likewise, in the case of the safari rental company, after spending considerable money fitting new DC-DC systems, the problem got even worse due to the limited 20A output. It was only solved when the company went back to a National Luna solenoid system and upgraded the batteries from wet-cell units to dry-cell (AGM) batteries. The company also invested in a set of 220V maintenance chargers and since then their dual-battery problems have been solved. If your dual-battery system is giving you trouble, there’s a good chance your battery is to blame – even if it’s less than a year old. If you suspect your battery is in a partially discharged state, invest in a 220V maintenance charger before the battery suffers permanent damage, along with a subsequent loss in performance. In 2016, National Luna conducted dozens of laboratory tests on a variety of battery types and split-charging setups. The results led to the recent launch of a brand new National Luna Maintenance Charger, built specifically for overland travellers. 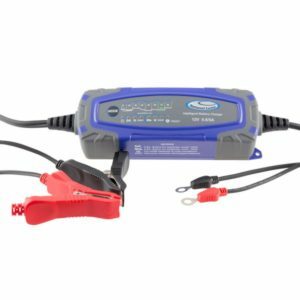 The charger is designed for motorcycle and 4×4 applications and it features an eight-step re.charge process that includes an analysis of your battery’s charge state, along with the option to select a boost mode in cold conditions. More importantly, it’s programmed so that it can be left connected to your battery for an indefinite period, and you’ll never have to worry about the battery heating up or “overcharging”. At R1 595, it’s one of the most affordable intelligent maintenance chargers on the market, and an essential piece of equipment if you want to get the most out of your auxiliary battery, while avoiding future dual-battery problems. The National Luna 220V Maintenance Charger is available at all major outdoor stores and 4×4 fitment shops.